Maharishi Vashistha described him, one who is born with auspicious symbols (lakshna), thus he named him Lakshman. However, according to the Guru Granth Sahib, the name Lakshman is a symbol and it signifies mann (mind). Hence by Guru Granth Sahib’s translation, the name means one with good mind or values. Sumitranandan, one who brought the joy in the life of Sumitra. 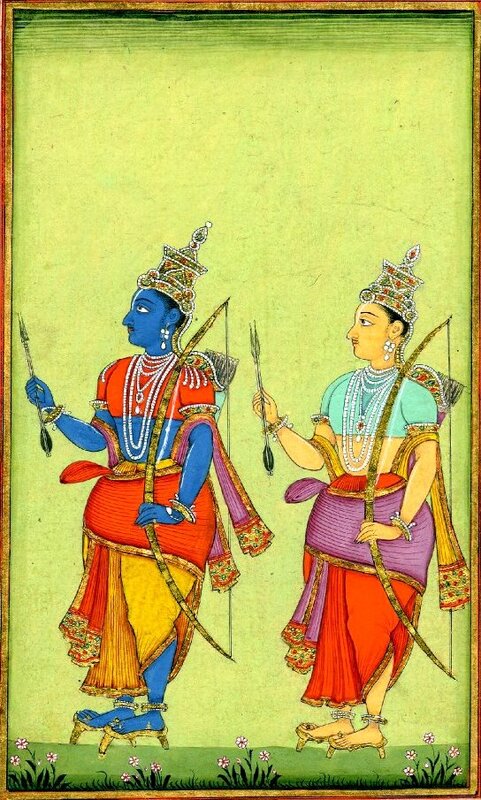 As he was the first child of once-childless Sumitra, he was mentioned in Ramayana as Sumitranandan. The name Soumitri simply translates as the son of Sumitra. Along with his twin brother, Shatrughana, he is known as Soumitri. Dashrathatmaja, a popular sobriquet given to Lakshman, along with his brothers, Rama, Bharat and Shatrughana. The Sanskrit word atmaja means a part of the soul, defining the name as the part of Dashratha’s soul. Bharatanuja is another byname given to Lakshman. The name Bharatanuja simply translates as the younger brother of Bharat. As he was younger to Bharat, he became Bharatanuja.